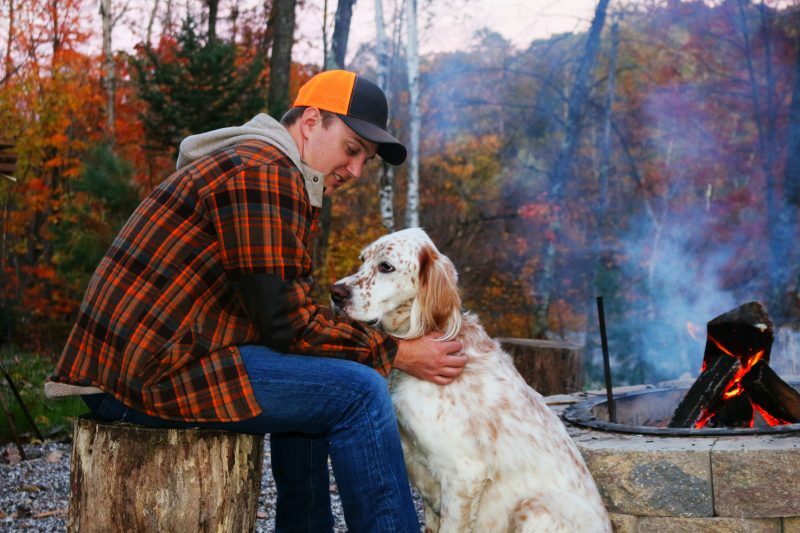 On the 4th day of our annual grouse week in Wisconsin my dad had to go back to work for the rest of the week, so it was just me and my English Setter Trigger. This unfortunately meant that our limit for woodcock hunting was down to just 3 since I was the only one hunting, but even 3 is never a guarantee! Trigger and I got out to our favorite spot early Monday morning. Mornings are by far my favorite time of day to grouse hunt. There’s just something about getting out early in the morning when everything seems to be relatively still that makes for an incredible hunt. I threw Trigger’s Garmin Sport Pro on him, slapped a could of size 8 shot shells into my Citori, and started down the dirt road to my favorite thick bunch of cover in the area. I didn’t even get up to the spot yet & Trigger was on a rock-solid point. Trigger clearly meant business this morning! I worked my way into about as good of a position as you can ask for in thick grouse cover & started easing into the area that Trigger was pointing. Suddenly the sound of that distinct woodcock whistle filled the air, and the bird was airborne. In that split second I reacted as I have hundreds of times before. I got my Citori to my shoulder, led the woodcock a bit to the left as it flew, and squeezed the trigger. It folded up and fell from the sky, along with a few treetops from the 6 year old aspen stand we were hunting. Within two minutes of our woodcock hunting starting, we had our first bird. I had no more gotten the bird picked up when I noticed Trigger’s bell wasn’t going anymore. That typically means one thing – he’s locked up on another bird. I was so busy patting myself on the back for getting a bird so quickly that I hadn’t really paid attention to where he went, so I started circling my spot looking for him. When I finally found him he was in a little bowl only about 30 yards from where the first bird went down. That isn’t far in a clearing, but in this cover that might as well be 250 yards. Some of the leaves were still up on the trees and visibility was only about 10 yards, maybe 15. I worked my way into position, impressed both at how quickly he found the next bird and how long he was holding his point. We were likely going on about 3-4 full minutes of him pointing by the time I had made my way to him, and for Trigger I’m sure that felt like an eternity. The cover here was exceptionally thick, and just getting up to the point was a chore. Trigger was rock-steady on the point, but I’m sure on the inside he was screaming wanting that bird to fly. I finally got into position and the bird whistled up into the sky. This shot required a hard right swing, and my first shot went behind the bird. I had to quickly pull my gun down to get around a bit of cover and get back on the bird. When I pulled the trigger the second time the tighter choke for my top barrel did it’s job as the bird fell from the sky. By the time I realized my mistake, another 3 birds had erupted from the same area we had been working. While I was a bit peeved at my lack of reloading, I was in awe at the number of woodcock in the area. We had literally just started woodcock hunting about 5-6 minutes ago, and we had already flushed 5 birds. I wasn’t even 100 yards from my truck yet!!! I finally made my way to our downed bird & got going again. I half expected Trigger to be on point when I looked up, but he wasn’t yet. We started to angle our way along the edge of the bowl we were in. By the time we had reached the opposite side we had what I fully intended to be our last bird of the day. Keep in mind that our previous days of hunting we were logging at least 10 miles of hiking each day. The general rule of thumb is that Trigger was likely doing anywhere from 3-5 times that. This fast-paced hunting was not normal, but gosh was it fun! This bird was in by far our friendliest cover of the day. I worked my way through the lighter brush into position relatively easily. When the bird flushed it came right at me, directly over my head. I pivoted on my back foot, and put my bead behind the bird. As I swung through it I squeezed the trigger. I had just shot my limit of woodcock within 15 minutes. 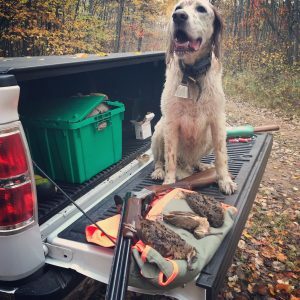 Something I love about grouse and woodcock hunting is that you can hunt most of the day without limiting out. Even if you limit out on one species, managing to shoot a limit of 5 grouse is a chore. Flushing five grouse is typically very doable. Actually folding 5 of these birds up and getting them into your vest is an entirely different story though. This year the grouse numbers are down, so I had already decided not to shoot more grouse. It literally took me longer to get here than it did to bag all my woodcock. That’s a great problem to have, but I can’t say it’s one I’ve ever had before. Do I forget what we said & hunt grouse anyways? Do I walk around aimlessly for a few hours? What the heck does a guy do after he limits out in 15 minutes!?!? Confused, I decided to pack up and head back to the cabin to clean my gun & do some fishing. The fish weren’t biting, but that didn’t matter. It was a perfect day to simply hang out and relax in the boat with Trigger.